Two of my favourite quilt or craft shows are the Central Alberta Quilt Show (April 3&4, 2015) or the Creative Stitching & Crafting Alive show (September 25-26 in Calgary). I love seeing the new fabric lines and the patterns and often come home with a ton more ideas in my head of things I want to do or try. Many of the fabric shops that have booths at these markets, package their fabrics up into tempting little packages of what quilters call fat quarters. Normally, fabric is sold off the bolt with a quarter yard measuring 9"x the width of the fabric (44"). Fat quarters are also a quarter yard of fabric, but the fabric is cut a full yard and then in half, both lengthwise and crosswise to yield a piece of fabric that is 18" x 22". Quilt shops will then package these fat quarters up into coordinating bundles that are so very tempting to the quilter who is walking through their booth. Last year I picked up a pack of 5 fat quarters and this week I sat down and sewed a few things with it. The first thing I did was cut materials for 2 tea cozies. These are a little different than the cozies I've made before and the sewing of the gathered bottom edge onto the circle base was more awkward than I thought it would be. 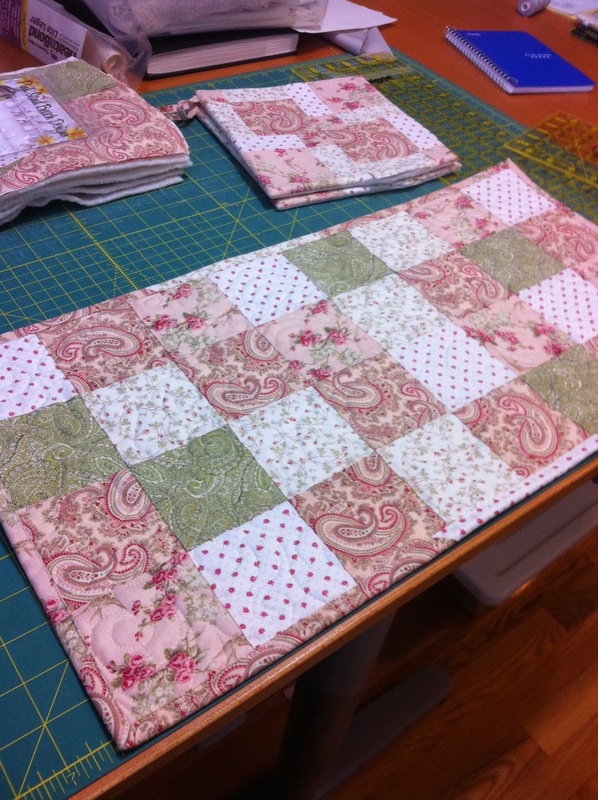 The next thing I cut was some squares for a simple table runner. One of the challenges I've set for myself in 2015 is to step up my quilting skills and learn a few different designs so I can do more than one or two quilting designs. 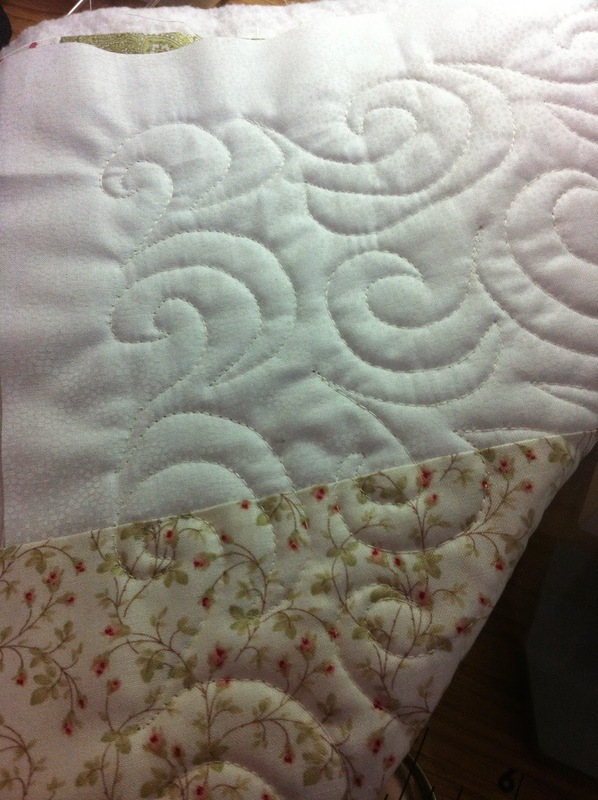 I pieced a backing from what was left of the fabrics and a plain tone on tone off-white fabric, layered it and pinned it and started quilting. As the amount of fabric I had left was dwindling rapidly, the next project was a pair of potholders. 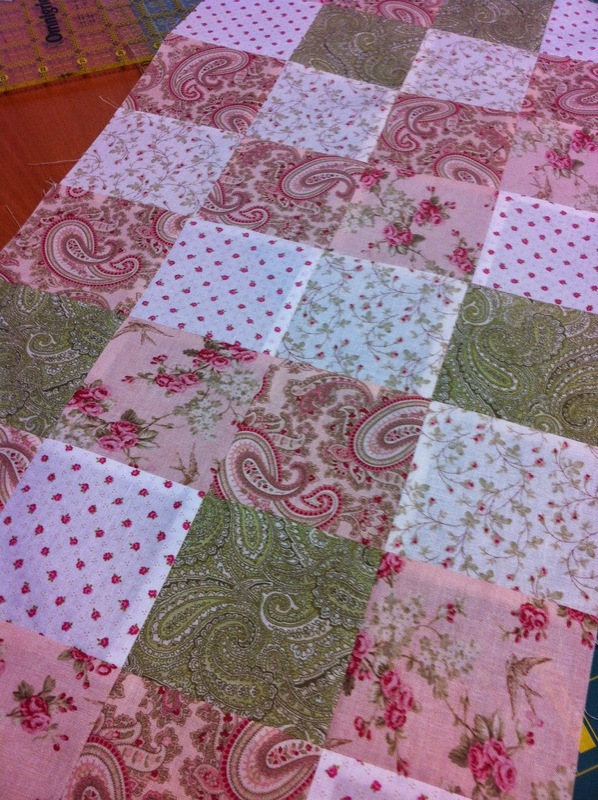 I used the left over squares from the table runner and used a disappearing 9-patch pattern. These potholders finished up at just under 8.5", a nice size for using in the kitchen. I still need to find a better way to attach the loops - I like my potholders to have a loop at the corner, but I just can't seem to find a way to do it so they look good. The remaining small pieces will be cut and added to my scrap boxes of 1.5", 2" or 2.5" squares for the next scrap project I make.